Another welcome release from Silva Screen, this is a collection of the incidental themes by Murray Gold for the last series of Doctor Who. Gold has completed some stunning work for the show and certainly proved his many detractors wrong with the huge success of the Children In Need and Proms concerts as well the three albums that showcase his work. My only criticism is that some of his work is too often buried underneath all the other business of the show. Anyway, we open with the slightly reconfigured Doctor Who theme which not only keeps the electronic swoops courtesy of Delia Derbyshire but also adds in a bit of the underrated Peter Howell wah-wah guitar-like electronics. He's also added in that expansive drum section too which gives the whole thing a kick up the arse. I'm not sure it's entirely successful. Onwards then to the lovely, infectious jazzy pop of A Noble Girl About Town which picks up on the motifs of The Runaway Bride Xmas Special and adds a playful vibe to the opening episode of Series 4, Partners In Crime. Life Among The Distant Stars is a wistful combination of piano, strings and woodwind and it's a musical motif that reappears throughout Series 4 in various guises. It articulates well much of Donna's eventual fate. Bit of blood and thunder 'chase' type music with Corridors And Fire Escape, which frankly Murray can do in his sleep and it's a little too generic for my tastes. Much better is The Sybilline Sisterhood with its use of brass, wailing vocal motifs and high strings. This is further surpassed by Songs Of Captivity And Freedom, a melancholic piece of beauty, all aching strings but then punctuated by a soaring vocal passage that fits perfectly to the Ood's symbolic function in the story Planet Of The Ood as well as prefiguring the Song Of Freedom that would eventually get the full, bombastic treatment in Journey's End . Quite an exquisite composition. ...jaunty, chamber based pieces in a similar tone to the superb Anne Dudley music for Granada's Jeeves and Wooster. UNIT Rocks is essentially a beefed up version of the theme that was first introduced back in The Christmas Invasion. Big, bold, brassy. The brassier side of things continues into The Doctor's Daughter and it's given a Hermann-esque stridency and then climaxes with a choral motif from The Doctor's Theme. It doesn't stay around long enough as a cue to really make an impact. I'm also underwhelmed by The Source, from the same story. It's inoffensive but again doesn't have enough of a hook apart from the piano and string climax and there are little stings and reflections on the series main themes. Gold goes for Poirot-like bassoons on The Unicorn And The Wasp, some warbling electronic tonalities and jaunty, chamber based pieces in a similar tone to the superb Anne Dudley music for Granada's Jeeves and Wooster. The Doctor's Theme gets another reinterpretation here, with a full choir and low strings. It's rather grand, baroque music, soaring and magnificent and actually gets this album back on track. Full on orchestra and stunning work from the choir. Another delight is the Voyage Of The Damned Suite with it's Mission Impossible opening going into a sweeping motif of The Doctor's Theme with cor anglais, insistent drum and brass. There's a breathy, floaty vocal piece for Astrid as well as a revisitation to many of the familiar themes for Series 3. And do I detect an organ in there too? It captures the epic scale of the story with some further stunning high strings, brass and pounding rhythms. The scoring for Astrid is a sweet, light contrast to the bombast and brings us to the end of the track on a bitter-sweet note. The music for Silence In The Library/Forest Of The Dead does reek of Danny Elfman too much for me. It's the overuse of brass and high strings on The Girl With No Name that's putting me off here. 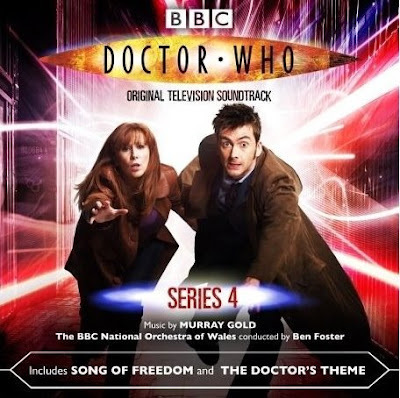 The Song Of Song starts as a reworking of The Doctor's Theme with a treacly nursery rhyme aspect to it and goes into strident brass flares and soaring strings. Again, very Elfman. All In The Mind is a welcome, and left field, respite with woodwind and acoustic guitar and some shimmering organ painting us a Beatles-like picture of Donna's other life. Silence In The Library is better, with much more restraint being used, and is a superbly plaintive piece of scoring that doesn't outstay its welcome. The Greatest Story Never Told is another stand out track. Murray certainly knows how to use a choir and this is shown off here with the male voices in a call and response variation on all The Strange Strange Creatures that then drops into a pulsing, slower passage, bringing in the sopranos and a rising, rising string passage. It ends with the orchestra belting out powerful brass flares and jogging strings. Stunning. Now, things really get interesting. For me the music from Midnight is the stand out here. The colorations are spot on with piano highlights, twitchy percussions and big brass attacks. It is slightly reminiscent of Goldsmith's music for Alien and Giacchino's incidentals for Lost but it's still a nerve shredding composition. That aggitated brass passage at the end is utterly brilliant. The music for Turn Left is also an opportunity to get away from the full on orchestra with its piano, synth washes, acoustic guitar. A moody composition with some breathy choral passages of The Doctor's Theme, rattling percussion to suggest the time beetle and atonal synth lines. I think I cried through A Dazzling End the first time I heard it properly here. Guitar, drums, shimmering layers of strings then added to with a soaring string melody line, brass licks and attacks. And it's all too brief. Still, you will weep buckets through The Rueful Fate Of Donna Noble which is a strong contender for the being the best track here. That combination of guitar lick, whistling motif, melancholic strings...well I'm off again, typing this through tears. Really, really beautiful. Here comes Davros. Gold goes for atonal experimentation with treated percussion and big piano sections and groaning brass. Again, little echoes of the Giacchino music from Lost. Fantastically atmospheric and as far as you can get from the earlier over-ripe Elfman pastiche. And more Dalek choirs for The Dark And Endless Dalek Night. All very Wagnerian, and basically everything but the kitchen sink, to make this Dalek music to end all Dalek music. When it calms down a bit, it's a lot more interesting and has a feel of Janacek to it. The jittery electronic percussion of A Pressing Need To Save The World winds its way through bold brass and strings that have a brief echo back to A Noble Girl About Town as well All The Strange Strange Creatures and This Is Gallifrey. It's a real melting pot with Gold piling in as many echoes back to the previous three series. Then there's the Indian influence on Hanging On The Tablaphone which throws the whole thing into a bizarre left curve - electronics, tablas, shouting choirs and guitar washes. Very interesting. Do I like Song Of Freedom? Not really. It's all a bit overblown and quite honestly, I'm sick to death of that choir now. It's an interesting use of electronics and percussion over the soaring voices but it doesn't do it for me, emotionally. Rather like the episode it comes from, Journey's End, it's a bit up itself. And we conclude with the series' Closing Credits, complete with middle eight, piano tinkles, swooshes and bashing percussion. A good album, beautifully produced but not quite in the same league as the previous albums. There's a little too much careering between bombast and syrup for my tastes and where it excells it's in the more experimental compositions and where restraint has been applied. Certainly for me, the music from Midnight and Turn Left are the highlights here, with the themes for Donna, Davros, the Ood and the Voyage Of The Damned Suite also well worth a listen. And it does feel like the end of a journey musically too as it would appear that Murray will not be composing for the series in the future. He has a talented protege in the form of Ben Foster whom I hope will take up the reigns. One thing is for sure, Murray has made the music for the series appropriately bold and cinematic and that's a stunning achievement. The CD isn't out yet but you can download the album now from Silva Screen. Brilliant article, Frank. :D Personally I think that the Dalek music (the music of destruction) is closer to Orf than Wagner. And I definitely think that Clint Mansell and Hans Zimmer are massive influences on Murray's work (particularly, for example, All the strange strange creatures). Thanks for those comments. I bow to your superior knowledge on music, especially regarding Orf/Wagner. Yes, I do agree on the Hans Zimmer observation. There's a big influence there. I had kind of worked out that Murray would be around for the specials. All part of that fin de siecle tone now struck with the departure of RTD, David et al. I wonder who will replace him on Series 5? Maybe not Ben Foster. That wouldn't really be a clean break. I'm very sad , myself (in OH so many ways) as I love Murray. I would invite you over to have a peek at my blog but I suspect you'd find it a bit......crap. And indeed amateurish compared to this. Hmm, I love Ben's work too and it would be a shame for him not to step into Murray's shoes. Other than Ben, who would be up to doing the show. Joby Talbot would be fantastic as I've admired all the stuff he's done with Neil Hannon and The League Of Gents. I've already had a look over at the blog, Gill. When I've a bit more time then I'll have a proper read. It looks fine to me. You make it what it is, to suit you. This blog has already gone through two make-overs because I'm never ruddy satisfied! And I want it to look good because I'd love someone to employ me to do reviews! It's my calling card more than anything else and provides an avenue for writing that I wouldn't ordinarily have. Murray Gold has detractors? Because I think he's a genius. I was watching VOTD this past weekend and realizing how much Murray actually adds to the show. When 'Rose' first aired in 2005 a rather vocal contingent of fandom tore Murray's music to shreds. If you read RTD's book 'The Writer's Tale' he mentions this and the fact that Murray was genuinely shocked by the reaction. He still divides opinion with many fans.